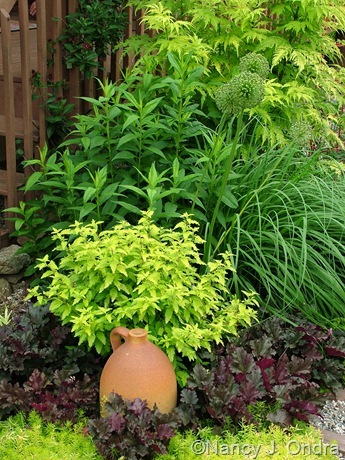 For a long time, all we had was ‘Worcester Gold’ (shown above), a selection of Caryopteris x clandonensis. Its relatively slender leaves emerge bright yellow and generally turn either greenish yellow (in any shade) or a somewhat bleached yellow (in full sun) through the summer. Here in Pennsylvania, it usually blooms in August, with somewhat washy blue flowers. A regular trim back to about 8 inches, just as new growth is emerging in mid-spring, keeps the plant dense and well-shaped; otherwise, it tends to get sprawly and whole branches may split off. A few years ago, a new-and-improved version came on the market, called Sunshine Blue (C. incana ‘Jason’) [shown above and below]. 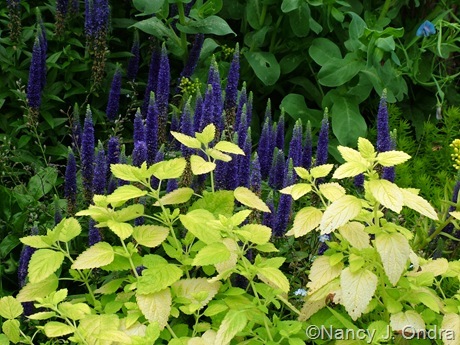 It’s similar to ‘Worcester Gold’ in habit (typically about 3 feet tall and wide), but with shorter-and-wider leaves that tend to carry a more distinct yellow color through the growing season, especially in full sun, as well as richer purple-blue flowers that start several weeks later. I’ve found that both ‘Worcester Gold’ and Sunshine Blue self-sow here. 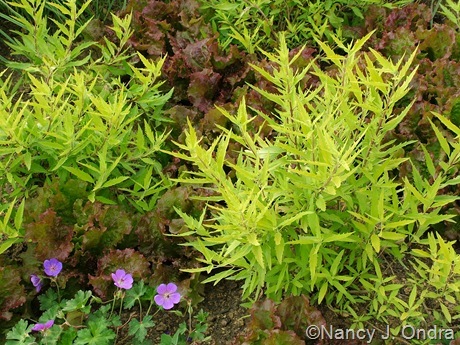 ‘Worcester Gold’ produces a dozen or two new seedlings a year, and about three quarters of them have golden foliage. Sunshine Blue has produced only a half-dozen seedlings total in a few years, but so far, all of them look just like the parent plant. Both of the original selections are available through many mail-order nurseries. 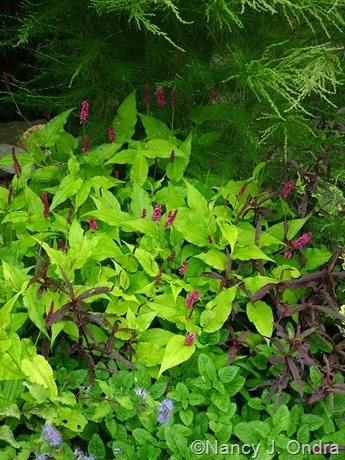 A truly herbaceous perennial that I greatly enjoy for its long season of bloom is fleeceflower (Persicaria amplexicaulis). But even I have to admit that its foliage isn’t much to speak of (unless one is speaking about leaves that Japanese beetles find irresistible). The selection ‘Golden Arrow’ offers the best of both worlds: spikes of reddish pink flowers from midsummer well into fall that perfectly complement bright yellow to green-tinged yellow leaves. Sadly, it too is a magnet for Japanese beetles, but I consider beetle-picking sessions each evening for a month or two every summer to be well worth the time. You can acquire ‘Golden Arrow’ from Digging Dog and Avant Gardens. While some persicarias have a reputation for being aggressive spreaders, ‘Golden Arrow’ stays in well-behaved clumps. The same is not true of this yellow-leaved selection of sticky germander: Teucrium viscidum ‘Lemon and Lime’. This one really likes to wander, though it seems to still play well with others, weaving around and popping up in empty spaces to form surprising combinations. Its new shoots are a very pale yellow to near-white, aging to a light yellow with a few green splashes. It generally reaches about 18 inches tall for me, with barely noticeable pale pink blooms later in the summer. If you’re prepared to accept its wandering ways, you can buy ‘Lemon and Lime’ from Avant Gardens (they list it as ‘Lemon Lime’). You might also find this cultivar sold under its former botanical name, Scrophularia buergeriana. In keeping with the lemon theme, I next present one of my most favorite golden-foliage plants: ‘All Gold’ lemon balm (Melissa officinalis). I hear the groans of all of you who’ve grown regular lemon balm and know its tendency to sow far and and wide. 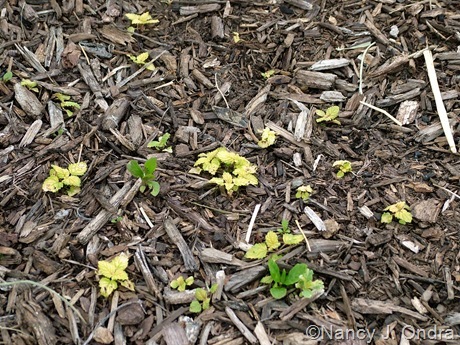 Yes, ‘All Gold’ does that too, but at least its seedlings are also bright yellow, so they’re easy to spot. 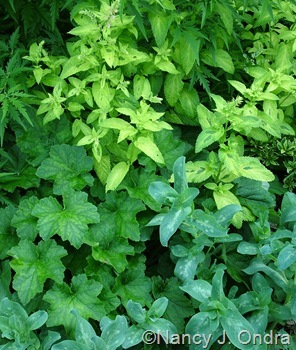 ‘All Gold’ lemon balm plants typically stay about 1 foot tall when trimmed as described. 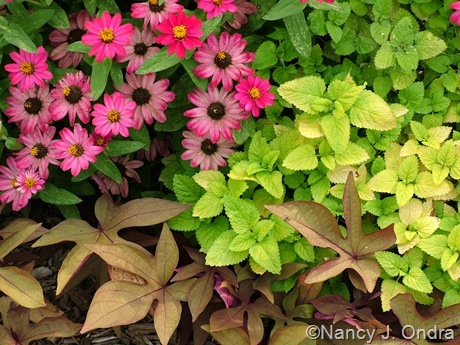 Their leaf color is richest in ample sun, but it can bleach out if the sun is too intense or scorch if the soil dries out too much, so partial shade is often a better choice. One source for ‘All Gold’ (also sold as ‘Gold Leaf’) is Glasshouse Works. For a very similar foliage effect without the spreading potential of lemon balm (and without the fragrance, too), you might consider a yellow-leaved veronica instead. Yes, I know veronicas can be unreasonably miffy, but I’ve found these two golden cultivars to be surprisingly dependable. 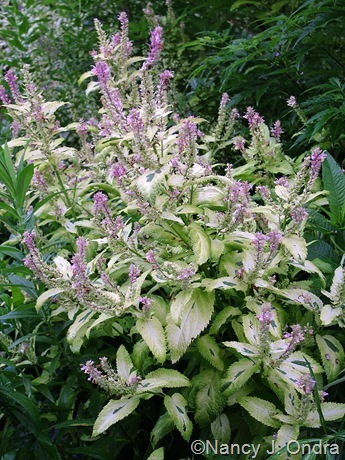 Above is Veronica prostrata ‘Aztec Gold’, and below is the older cultivar ‘Trehane’. They look very similar color-wise, at least early in the growing season, but in my experience, ‘Trehane’ tends to go somewhat greenish yellow by midsummer, while ‘Aztec Gold’ holds its intense yellow color all the way to frost. That might be because ‘Aztec Yellow’ also grows well for me in full sun, while ‘Trehane’ tends to prefer some afternoon shade. 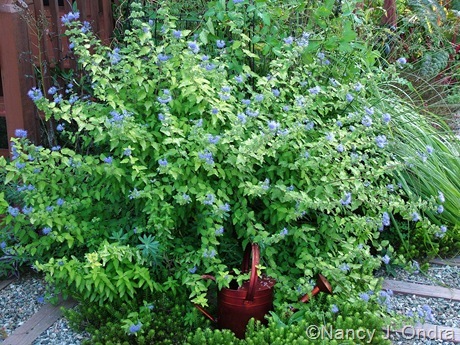 Both have tiny blue flowers in late spring; they’re pretty in bloom, but I usually shear them back by early summer to encourage fresh foliage for summer. 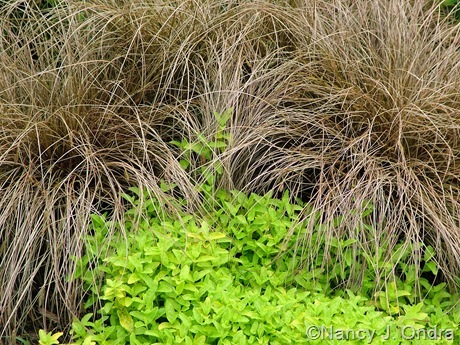 The gently creeping clumps stay about 4 inches tall. Joy Creek Nursery currently lists both ‘Aztec Gold’ and ‘Trehane’. And now, another apparently gorgeous golden perennial: ‘Gold Bullion’ mountain bluet (Centaurea montana). What’s not to love about that combination of sunny yellow foliage and rich purple-blue blooms? If it would only stay this way for more than a few weeks in spring, ‘Gold Bullion’ would easily earn a place in my top-ten favorite plants. But what no one ever shows is how incredibly ugly it is a bit later on in summer, when it turns a sickly-looking yellowish green that’s simply impossible to love (for me, anyway). I’ve fallen for it three springs in a row and ripped it out three summers in a row. No matter how darn pretty it looks in a pot, I swear I will NOT fall again this year. If any of you have grown ‘Gold Bullion’ through at least one full growing season and been happy with it, though, I’d be very interested to hear your opinion. 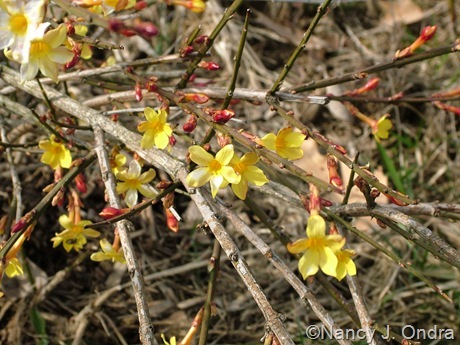 This next one doesn’t really fit with the other plants I’ve mentioned: for one, it’s definitely a shrub, and second, its gold comes from the flowers instead of the foliage. But it’s such a pretty thing that I thought it deserves a few seconds of fame now, since it missed March’s Bloom Day and will be done by the next one. Ohh, you got me with that dark leaved hellebore. We tried to have a low hedge of the Worchester Gold, but it kept dying out. We still have a few, the color is great, but your Sunshine Blue sounds way better. 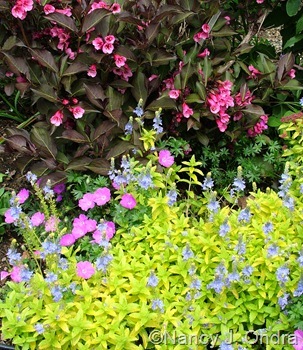 You have given us lots of ideas of plants to look for to add to our gardens in this series, thanks! I’d be very interested to hear how Sunshine Blue performs in your conditions, Frances. It’s definitely been a winner here. I think I could find a home for that ‘Aztec Gold’ Veronica – I’m a sucker also for blue & chartreuse. I have several Hellebores with that dark foliage, but I’m not sure if it’s too much with Heucherella ‘Burnished Bronze.’ I’d put in some Campanula ‘Dickson’s Gold’ to set them off, but I’m experimenting with a monochromatic effect there. I do think you’d enjoy ‘Aztec Gold’, MMD; I’ve had better luck with it than any other veronica. I love the idea of the dark foliage combo. The one problem I have with the dark-leaved hellebores, and the heucheras and heucherellas too, is that they blend right into the mulch unless you can see them up close, or unless there’s some other foliage color for contrast. You definitely have the ‘Midas Touch’! Your combinations are so exciting both in color and texture. I am making notes! Oh, now, wouldn’t that have been a much better title for this series of posts? Good one, Layanne! You’ve definitely inspired me to pay more attention to foliage color, Nan. I’ll be referring back to these posts often. My lemon balm isn’t yellow leaved, but it smells gorgeous, and oh boy, does it spread! Thanks for the tip for keeping it looking good. I always intend to trim it, but never seem to get the job finished even if I get started. What do you use to trim? The battery powered sheers have to be replaced every year or two and that gets expensive. I brought home a couple of seedlings of Caryopteris from our son’s garden last summer. It’s not either of the varieties you mentioned, but it’s lovely, and don’t the bees love it? I’m hoping it survived the winter. I use a pair of hedge shears on my lemon balm, Kerri; that way, it takes just one or two cuts per clump. Yes, bees, butterflies, and all kind of other insects seem to love the caryopteris flowers. Good luck with your seedlings! The Midas Touch, I like it! And, surprisingly, I like the All Gold lemon balm too. I’d rather have that than the ordinary one that is growing in my potager. Gorgeous hellebore! Recently I saw one at a nursery in Belgium that was even darker in both flowers and foliage than this one. Almost black in fact. Not for sale though, not yet. Good to hear from you, Yolanda Elizabet! I see from Google that several herb nurseries in the UK carry ‘All Gold’, so maybe you’ll be able to find it for sale in your area at some point, if it’s not there already. And many thanks for the hellebore information. 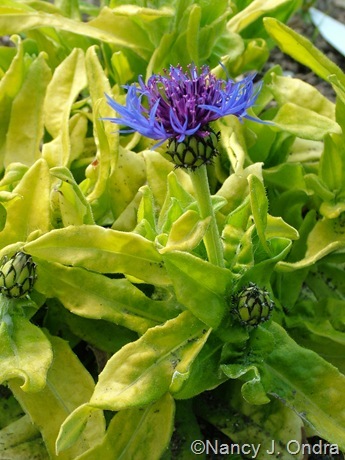 Well, I do have Centaurea montana ‘Gold Bullion’ on order from Bluestone. Now I’m not excited. Way to burst my bubble. I heard it isn’t too hard, though, anyway. I’m sorry, Benjamin. I remember now that you were excited about ordering it. I hope that for you, at least, it stays as beautiful as it is in its catalog pictures. And if it does, I hope you’ll report back on your blog. Maybe, just maybe, I could give it one more try. I’ve been wanting to add a caryopteris in our garden and you just gave me more reasons to do it! It’s good to know that they self sow readily. Great pictures as always! Thanks, Dave. I hope you have luck with the caryopteris, and that it self-sows for you too. I don’t see many other people commenting about that, but I can’t be the only person who gets seedlings. 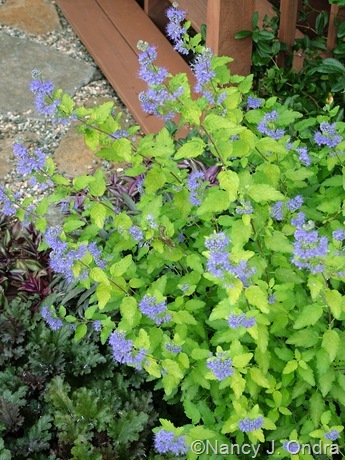 I loved your posting about Sunshine Blue Caryopteris. I would like to get more details about this plant. Could you email me offsite? Thanks. Thanks, Danielle. Look for an e-mail.